Flash! Savior of the Universe! As a hero of the ages, Flash Gordon has rescued the Earth in cartoons, films, and comic strips. Today, he's saving the world as an action figure designed by Alex Ross! The Flash Gordon Movie 7-Inch Action Figures Series 2 feature the industry's finest sculptors combined with the amazing designs of Alex Ross to create collectibles that are truly out of this world. Each figure includes multiple points of articulation, special accessories, and a sense of hyper-realism that will rocket these action figures into the stratosphere! 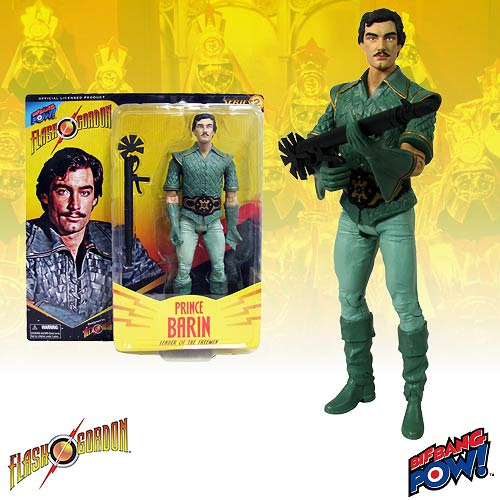 Presented here is Flash's friend and King of Arboria, Prince Barin, complete with blaster rifle.